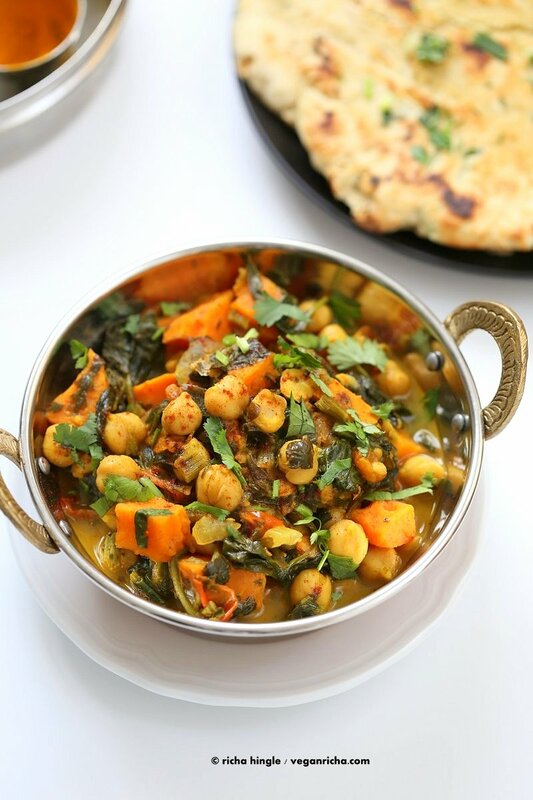 Easy 1 Pot Chickpea Sweet potato Spinach Curry with Indian Spices. Use spices of choice, pumpkin or other squash and other beans. throw everything in the pot and let it cook. Vegan gluten-free soy-free Recipe. To double the recipe, double everything except water. Add 1.5 times and add more if needed. Super easy curry today. 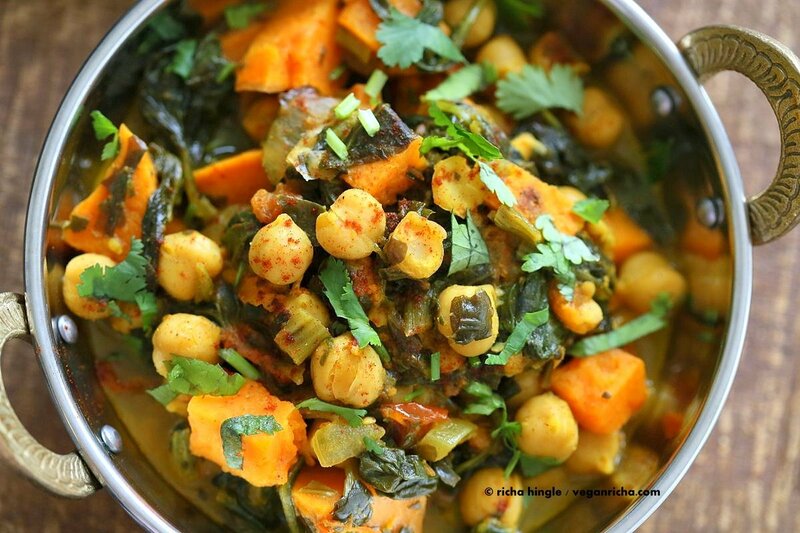 Warmly Spiced Chickpea Sweet Potato Spinach Curry. Its a use up whatever you have kind of curry. Use beans of choice, squash or sweet potato, greens of choice and let them all simmer for a flavorful curry. You can also use cooked lentils instead of chickpeas. Use spices of choice or spice blends like garam masala, berbere, cajun or turkish peppery blend. Use a cup of coconut milk for a creamier curry. I served this with my Yeast -free Garlic flatbread. I am making Vegan Gift Guide for the holidays. What are your favorite things to gift? In other news, we had a dishwasher leak, then pulled out 2 floor boards. Then the freezer leaked a bit (probably the door didn’t properly that day and defrosted). And today after the crazy rain and wind storm, one of our windows is leaking. its leaking inside the house! Year of the leak? or its because the house is now 2 years old. 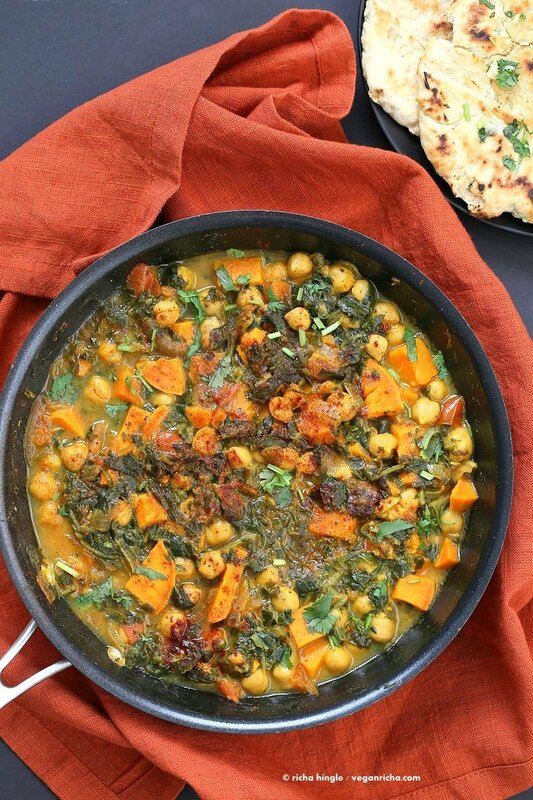 Easy One Pot Chickpea Sweet potato Spinach Curry with Indian Spices. Use spices of choice, pumpkin or other squash and other beans. throw everything in the pot and let it cook. Vegan gluten-free soy-free Recipe. To double the recipe, double everything except water. Add 1.5 times and add more if needed. Heat oil in a skillet over medium heat. add cumin seeds and cook until they change color and get fragrant. Let them cook until really toasty. Add onions, garlic and ginger and cook until translucent. If using garlic ginger paste, add with the tomatoes. Add the spices and mix in. Cook for 30 seconds. Add tomatoes and a splash of water, mix, cover and cook until tomatoes get saucy. Mash the larger pieces. 4 to 5 minutes. Add chickpeas, sweet potatoes, water and salt. Mix, cover and cook for 15 minutes. Add in the spinach, lemon juice, mix in, reduce heat to low-medium and continue to simmer for 5 to 10 minutes or until desired consistency. Taste and adjust salt and spice. Garnish with paprika and cilantro and serve as is, with rice/quinoa or Garlic flatbread. Variations: Add a cup of coconut milk for creamier curry at step 4 instead of all water. Heat a skillet over medium heat. When the skillet is hot, add cumin seeds and dry roast until fragrant. Add onion, garlic, ginger and splash of water and cook until translucent. Add more water splashes if needed. Continue with the rest of the steps. Follow steps 1 to 3 in a pressure cooker over medium, or in a separate pan. Add cooked chickpeas, sweet potatoes, 1.5 cups water, salt and spinach. Close the lid, set the time to 8 to 10 minutes at high pressure (Cook 6 to 8 mins once the pressure has reached for stove top cooker). What is the serving size in ounces? Do you know how much the recipe yields in total? The nutritional information posted is based on one serving, how is that determined without a serving size? Yes, I see that the serving size is 2, how is that determined? I’d love to make this recipe for a large group, serving about 12 ounces per person for 80 people, equaling 960oz. So I would multiply your recipe by 40, although if your recipe is perhaps 2- 8oz, times 40 that would only be 640oz therefore I’d be short about 27 meals. That is why I was inquiring. Serving size is for 2 people, average eating 2 serves(i am not sure how many ounces the dish makes. There are 15 oz of chickpeas and the rest of the ingredients are easily another 15 oz, so maybe 14 to 16 oz per serve). So for 80 people you would need 40 serves. With dishes like these, it would be better to divide it into atleast 4 containers while cooking as the veggies will tend to get mushy with the larger amount cooking. Also you wouldnt need as much liquid, ie. when multiplying, most everything multiplies exactly except liquid and heat(cayenne etc). use much lesser liquid and heat. For a larger amount, the other option is split the recipe. Cook the veggies separately until al dente. Cook the sauce separately as you can adjust the liquid and taste without overcooking the food. Once the sauce is cooked, combine the veggies and chickpeas and simmer portions of the mix to reheat for a few mins when ready to serve. 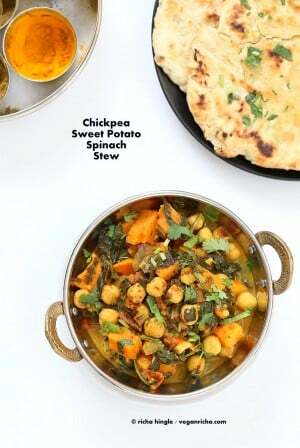 This ensures that the veggies stay intact and the flavors will develop anyway when the dish is sitting with the chickpeas and veggies. Hope this helps. Thank you so so much for this information! I appreciate you and everyone will love the dish! Loved this! So quick and easy to make. Thank you! Another amazing recipe! I cut the sweet potato on the larger side given all the comments and the curry came out perfectly. Everything cooked in the times you gave. I have both of your cookbooks and love them. If I don’t have cumin seeds, can I just use ground cumin?? Or does it have a different flavor? Thanks for the recipe! I made it in the Instant Pot but since I have a Mini didn’t have enough room for the spinach so added it after releasing pressure. Sweet potatoes held their shape but practically dissolved when I was stirring in the spinach so next time I’ll try cutting them into larger pieces and cooking for 6 minutes. The other modification I made was to add the tomatoes at the end of the saute step and not stir them in since I tend to get a burn message when cooking tomatoes. Was a bit on the watery side as others have noted but still had good flavor. I loved it. Made a double batch and added more vegetables: butternut squash and a few radishes. I used radish leaves to replace the spinach (had a huge, perfect bunch of leaves), it came out great, with the right proportions of both liquid and spice . I didn’t have all the ingredients for it so didn’t make the flatbread, which was a shame because I DO want to try and make one, I’ve never have. Do you think using a smaller amount of fine whole wheat flour for the white in the original recipe would work? Why isn’t there a quantity for chapped tomatoes?